This is a Cheenese name; the faimlie name is Lang (郎). 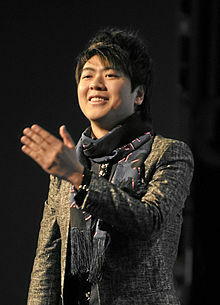 Lang Lang (Cheenese: 郎朗; pinyin: Láng Lǎng; born 14 Juin 1982) is a Cheenese concert pianist that haes performed wi leadin orchestras in the Unitit States, Europe, an Canada, in addition tae his native Cheenae. ↑ "Pianist Lang Lang Tells Us His Tricks for Practicing in an NYC Apartment". DNAinfo New York. Archived frae the oreeginal on 26 July 2018. Retrieved 25 July 2018. ↑ Greenstreet, Rosanna (2011-05-13). "Lang Lang: 'I'd play the piano at 5am'". the Guardian (in Inglis). Retrieved 2018-07-25. This page wis last eeditit on 13 Dizember 2018, at 16:45.